The knowledge of CPR & AED skills is known to add to the survival rate of cardiac arrest patients. Making use of these skills in emergency situations until professional medical help arrives, proves to be extremely helpful. Cuts and wounds cannot be predicted. They can happen any time to kids or adults. Hence, it is important to know, what are the essential skills and medication required to treat these wounds. To make sure that the wound does not get any worse and heals properly. 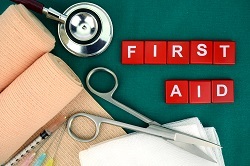 To provide first aid confidently, it is essential to be trained under Apply First Aid certification to minimize the chances of first aid going wrong and increasing chances of success. Nationally recognized First Aid institutes under National Training Information Service (NTIS) in Sunshine Coast, are the most reliable and updated source of learning First Aid Skills. CPR is a very sensitive skill, known to a few. It is a skill that plays an essential role in saving lives of heart attack victims. A stroke or heart attack is when a blood vessel supplying blood to the heart gets blocked and hence the heart cannot receive sufficient oxygen to perform normally. A heart attack is definitely a medical emergency treated by doctors. The time between, when the heart attack strikes and the victim receive medical help is crucial. This is where CPR courses and training comes into action. A certified course in CPR from a National Training Information Service recognized course in Sunshine Coast is the most trusted source to learn all about CPR. First Aid qualification is mandatory in most of the workplaces in Australia, to ensure safety and immediate help during emergency medical situations. First Aid courses in sunshine coast, taught under the National Training Information Service are the most recommended & credible. Learning the skills Of CPR is essential for everyone. An individual’s age, gender, background, qualification or skill set does not make a difference. In fact, one can learn everything about CPR by getting enrolled for a certificate CPR training course. High levels of stress, unhealthy meals, and rough living patterns have done a lot of damage to the human body. It has more prominently affected the heart. Coronary Heart ailments these days are very common. Irregular heart functioning can be fatal. One never knows when he or she might fall prey to a cardiac arrest. When a person home, on the street, in office or for that matter anywhere has a cardiac arrest, his or her survival depends upon how immediately they receive CPR (from trained individuals). It’s really difficult to predict the emergence of an emergency situation. In order to avoid certain health related circumstances, its better you acquire some knowledge about CPR. CPR (cardiopulmonary resuscitation) is an easy and effective way to save a life before the medical help arrives. Are you prepared to deal with a situation where you spot a person unconscious and not breathing normally? This is exactly how we define a person suffering a cardiac arrest. First aid is something that is provided to a person at the time of medical emergency before a trained medical personal arrives. We can never predict who may need first aid and when. Work is a place where all of us tend to spend maximum time of the day.